As slow-moving Tropical Storm Florence crawls across North and South Carolina, the region is experiencing heavy rainfall that is expected to rise exponentially in the coming days. The Marines, the Coast Guard, civilian crews and volunteers used helicopters, boats and heavy-duty vehicles Saturday to rescue scores of people trapped by Florence's shoreline onslaught, even as North Carolina braced for what could be the next stage of the disaster: widespread, catastrophic flooding inland. The death toll from the hurricane-turned-tropical storm climbed to at least 14, including an infant. A day after blowing ashore with 90 mph (145 kph) winds, Florence practically parked itself over land all day long and poured on the rain. With rivers rising toward record levels, thousands of people were ordered evacuated for fear the next few days could bring the most destructive round of flooding in North Carolina history. More than 2 feet of rain had fallen in places, and the drenching went on and on, with forecasters saying there could be an additional 1½ feet by the end of the weekend. New drone footage reveals flooding in New Bern, N.C., due to Tropical Storm Florence. "This system is unloading epic amounts of rainfall, in some places measured in feet and not inches," North Carolina Gov. Roy Cooper said. As of 11 p.m., Florence was centered about 40 miles (65 kilometers) east-southeast of Columbia, South Carolina, amd crawling west at 3 mph (6 kph) — not even as fast as a person walking. Its winds were down to 40 mph (75 kph). But with half of the storm still out over the Atlantic, Florence continued to collect warm ocean water and dump it onshore. "This is such a slow-moving storm that it will continue to create torrential amounts of catastrophic flooding," NBC Los Angeles meteorologist Shanna Mendiola said, adding that the danger may last for weeks due to hazards in the water like downed power lines or chemicals. In its initial onslaught along the coast, Florence buckled buildings, deluged entire communities and knocked out power to more than 900,000 homes and businesses. But the storm was shaping up as a two-part disaster, with the second, delayed-action stage consisting of epic inland flooding, caused by rainwater working its way into rivers and streams. The dead in North Carolina included a mother and baby killed when a tree fell on a house in Wilmington and two men in their late 70s who were hurt while outside in the wind and rain in Lenoir County. A woman died in Pender County after suffering a medical condition and large trees blocked roads to her home, a spokewoman for the county confirmed to NBC News. Three more people died "due to flash flooding and swift water on roadways," sheriff's officials in Duplin County said Saturday in a Facebook post, without giving more details. Florence made landfall in North Carolina on Friday morning, continuing to pound the coast with major flooding, rain and wind. An 81-year-old man died while trying to evacuate Wayne County on Friday and a husband and wife were killed the same day in a Fayetteville house fire, according to the state's Office of the Chief Medical Examiner. South Carolina recorded its first death from the storm when officials said a 61-year-old woman was killed when her car hit a tree that had fallen across a highway. State officials confirmed in a tweet Saturday night that a Horry County couple died due to carbon monoxide poisoning, bringing the death toll in the state to three. Two deaths in Carteret County, North Carolina, initially said to be storm-related were not; authorities there later said they were a murder-suicide. Authorities ordered the immediate evacuation of up to 7,500 people living within a mile of a stretch of the Cape Fear River and the Little River, about 100 miles in from the coast. The evacuation zone included part of the city of Fayetteville, population 200,000. 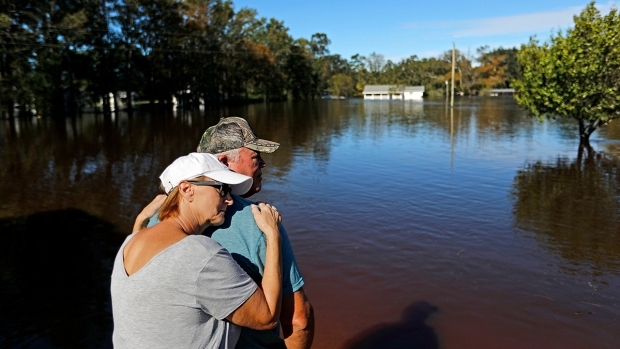 Officials in North Carolina's Harnett County, about 90 miles inland, urged residents of about 1,100 homes to clear out because the Lower Little River was rising toward record levels. North Carolina Gov. Roy Cooper held a briefing Saturday morning to talk about the state's response to Tropical Storm Florence. However, one potential road out was blocked as flooding forced the shutdown of a 16-mile (26-kilometer) stretch of Interstate 95, the main highway along the Eastern Seaboard. The North Carolina Dept. of Transportation asked out-of-state drivers to bypass North Carolina entirely. The agency is directing motorists to detour through Virginia, Tennesse and Georgia. "This is an extremely long detour, but it is the detour that offers the lowest risk of flooding at this time," NCDOT noted in an advisory on its website. In New Bern, along the coast, homes were completely surrounded by water, and rescuers used inflatable boats to reach people. More than 360 people had been carried to safety since Thursday night amid rising waters from a river swelled by both rain and storm surge. Kevin Knox and his family were rescued from their flooded brick home with the help of Army Sgt. Johan Mackie, part of a team that was using a phone app to locate people in distress. Mackie rode in a boat through a flooded neighborhood, navigating through trees and past a fencepost to get to the Knox house. "Amazing. They did awesome," said Knox, who was stranded with seven others, including a boy who was carried out in a life vest. "If not we'd be stuck upstairs for the next ... how long? I have no idea." 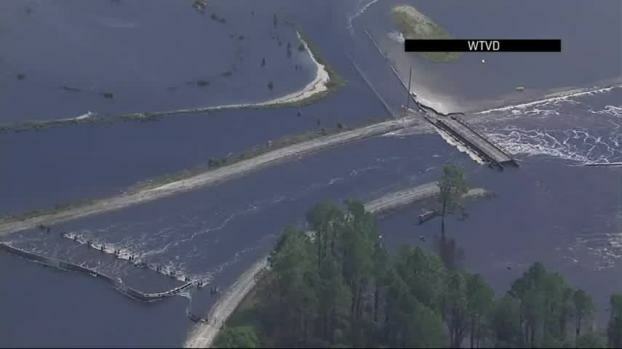 Duke Energy said Friday that a dam containing a large lake at a Wilmington power plant has been breached by floodwaters from Florence, and its possible coal ash from an adjacent dump is flowing into the Cape Fear River. Across the Trent River from New Bern, Jerry and Jan Andrews returned home after evacuating to find carp flopping in their back yard near the porch stairs. Across the street, Coast Guard helicopters were taking off to rescue stranded people. Coast Guardsmen said choppers had made about 50 rescues in and around New Bern and Jacksonville as of noon. Also, Marines rescued about 20 civilians from floodwaters near Camp Lejeune, using Humvees and amphibious assault vehicles, the base reported. Two deaths in Carteret County initially said to be storm-related were not; authorities there later said they were a murder-suicide. As of 2 p.m., Florence was centered about 50 miles (85 kilometers) west of Myrtle Beach, South Carolina, inching west at 3 mph (6 kph) — about as fast as a person walks. Its winds were down to 45 mph (75 kph). With half of the storm still out over the Atlantic, Florence continued to collect warm ocean water and dump it on land. The National Hurricane Center said Florence broke a North Carolina rainfall record that had stood for almost 20 years: Preliminary reports showed Swansboro got over 30 inches and counting, obliterating the mark set in 1999, when Hurricane Floyd dropped just over 24 inches on the state. As of noon, Emerald Isle had over 23 inches of rain, and Wilmington and Goldsboro had about a foot. North Myrtle Beach, South Carolina, had around 7 inches. Charlotte and Asheville in North Carolina, and Roanoke, Virginia, could also be in for heavy rains as Florence plods inland. Areas like New Bern also could see an additional 3 to 5 feet of storm surge as high tide combines with the seawater still being pushed ashore by Florence, National Hurricane Center Director Ken Graham said. Stream gauges across the region showed water levels steadily rising, with forecasts calling for rivers to crest Sunday and Monday at or near record levels. The Little River, the Cape Fear, the Lumber, the Neuse, the Waccamaw and the Pee Dee were all projected to rise over their banks, flooding cities and towns. North Carolina alone is forecast to get 9.6 trillion gallons (36 trillion liters), enough to cover the Tar Heel state to a depth of about 10 inches (25 centimeters). President Donald Trump is expected to visit the areas affected by the storm next week, White House Press Secretary Sarah Huckabee Sanders said in a statement Friday. Sanders said that President Trump will travel to the affected areas early to the middle of next week, "once it is determined his travel will not disrupt any rescue or recovery efforts." Meanwhile, on the heels of his controversial assertion, without evidence, that the reported number of lives lost from Hurricane Maria in Puerto Rico was inflated by Democrats as a ploy to tarnish public perception of his job performance, Trump undercounted the death toll for Florence in a tweet Saturday evening. "Five deaths have been recorded thus far with regard to hurricane Florence! Deepest sympathies and warmth go out to the families and friends of the victims. May God be with them!" Trump tweeted. While reports of how many people have been killed by the storm vary between 9 and 12, Trump's claim that there were only five victims undercounts confirmed deaths by at least half. His tweet comes on the heels of another assertion, without evidence, that the reported number of lives lost in Maria was an inaccurate count intended to blight public perception of his job performance. 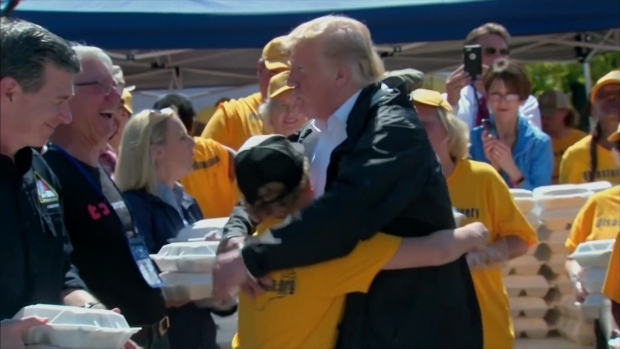 While visiting the areas battered by Hurricane Florence in North Carolina, President Donald Trump vowed to provide the area with all the resources they need for a full recovery. The storm interrupted a September rite in the South: college football. Schools canceled, postponed, switched sites or changed kickoff times because of Florence. No. 2 Clemson and Georgia Southern had sunny skies and unseasonably mild weather for the only major conference game being played in the Carolinas and Virginia. Forecasters said the storm will eventually break up over the southern Appalachians and make a sharp rightward swing to the northeast, its rainy remnants moving into the mid-Atlantic states and New England by the middle of the week. AP writers Jonathan Drew, Jeffrey Collins, Emery P. Dalesio, Denise Lavoie, Sarah Rankin, Gary Robertson, Meg Kinnard, Seth Borenstein, Michael Biesecker, Martha Waggoner, Jennifer Kay, Russ Bynum, Pete Iacobelli and Jay Reeves contributed to this report.